Did you know you could travel to unique and exciting destinations around the world through one of Laurier’s field courses? Created by Laurier’s outstanding faculty, field courses add experiential learning opportunities to your university education. Field courses give you a chance to travel and explore the places and topics you’re studying. Held between May and July, for-credit field courses run from 10 days to seven weeks. Introductory classes or pre-departure preparations begin on Laurier’s Waterloo and Brantford campuses. While abroad, students are guided by experienced Laurier faculty and international university partners. Get outside of the classroom, build life-long international connections with students around the world and make enduring memories by registering for one of Laurier’s field courses. Laurier students travelled to the coastal country of Chile for a three-week study tour in May 2014. The group began the tour by exploring the capital city of Santiago, bordered by the Andes Mountains, and the scenic port city of Valparaíso, getting oriented to the country’s long history, diverse culture and politics. The students attended guest lectures at University of Concepción, met with Chilean students and travelled to rural regions where non-governmental organizations and community groups work to promote social justice and sustainable forms of agricultural production. Then the group travelled south into the traditional territory of the Mapuche Indigenous people, where they learned about Indigenous struggles for land, rights, recognition and livelihood. Students also stayed with Mapuche families in the Elicura Valley, gaining a more intimate perspective of the culture of the region. During the spring term, Laurier students toured four of China’s most famous cities for seven weeks while studying modern Chinese history. Prior to leaving Laurier, students learned about China’s history. The small class size allowed for deep discussions on topics ranging from history to politics to contemporary social issues in China. Students also researched one historical site and prepared an oral presentation so that they could act as a guide for the group during their visit. While in China, students attended classes on the campuses of Laurier’s university partners in Beijing, Chongqing, Nanjing and Shanghai. They also toured the phenomenal historical attractions of the cities, such as the Great Wall of China, guided by their Laurier classmates’ oral presentations and peers from Laurier’s university partners in China. The Vimy Hall Residence Learning Community – a residence group of first-year students specializing in war and memory – embarked on a ten-day journey to France and Belgium in May. While trekking through farmers’ fields that were once battle sites, touring Vimy Ridge and visiting the monument of the Brooding Soldier, students learned about Canadian experiences during the First World War. Students gained hands-on historical knowledge while critically examining this period, which marked Canada’s coming of age as a country. The group was also able to compare how different countries represented their war experiences in monuments and cemeteries, taking a trans-national approach to interpreting sites. Hosted by the Laurier Centre for Military Strategic and Disarmament Studies, the centre has run battlefield study tour programs for over 20 years, giving students the chance to explore Canadian and international cemeteries, memorials, museums and battlefields in Belgium, France, Italy, the Netherlands and Germany. "Studying in the field is an excellent opportunity for Laurier students to extend their learning by stepping outside of the normal classroom environment to actually experience the subjects they are studying," said Mark Humphries, Dunkley chair in War and the Canadian Experience in the Department of History and director of the Laurier Centre for Military Strategic and Disarmament Studies. Laurier students journeyed to Mexico in May as part of a joint field course with Ibero-American University in Mexico City. Students from both universities discovered the challenges faced by Central American migrants who travel through Mexico by foot and train. Touring Mexico City, Tlaxcala, and the port city of Veracrúz, students met with “Dreamers” – the children of undocumented Mexican parents who grew up in the United States and were deported to Mexico – and learned about refugee asylum laws in Mexico and the country’s human rights issues. Students then took time to work in migrant shelters, preparing meals for the migrants and hearing first-hand about the migrants’ journeys. After returning from Mexico, the Laurier students then hosted their peers from Ibero-American University at Laurier Brantford to learn about the services and programs in place for migrants in Canada and the effects of migration and integration on receiving communities and the migrants themselves. 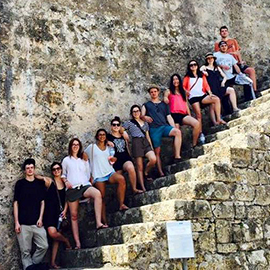 Laurier students immersed themselves in the language and culture of Spain in June, applying their language skills during interactive visits to dozens of major cultural, historical and artistic sites across the country. Students lived with a Spanish host family during the month-long course and explored 14 cities around northern, southern and central Spain. Over the summer, Laurier students voyaged to Greece’s ancient plains for the Western Argolid Regional Project (WARP). Students undertook an archaeological survey, searching for evidence of human activity from the Neolithic period (4,000 BC) to the modern day in the Argolid Plain, a focal point of human activity for the whole of Greek history. Each day, students uncovered a different part of the survey zone, walking the fields looking for artifacts or other signs of past human presence. Over 30,000 artifacts were collected and taken to the laboratory in Argos, where students assisted in the analysis. Students also visited major historical sites, such as Corinth, Nemea, Mycenae, Tiryns, Argos, Stymphalos, and Lerna, in addition to smaller centres like Aidonia and the Elleniko pyramid. The group relaxed on the beach in the village of Myloi where they stayed along the Argolic Gulf and visited the picturesque town of Nafplio across the bay during their free time. “The second season of WARP was a rousing success and everyone involved was sad to leave when our field work was done,” said Scott Gallimore, assistant professor in Laurier’s Department of Archaeology and Classical Studies. Field courses to China, Spain, Chile and Greece will be held in the spring/summer semesters of 2016. Puerto Rico – Students will gain hands-on experience in the Caribbean, learning about the history of Puerto Rico and the legacy of piracy and slavery. Kampala, Uganda – Students will explore the dimensions and drivers of urban food security in Africa. Israel-Palestine – This course will introduce students to the current realities and historical contexts of the Israeli-Palestinian conflict. Austria – Through an intensive exploration of Vienna, students will investigate and experience the key qualities that comprise the contemporary livable city. Find out more information about Laurier field courses.